Model# CA301192SSBL. Stainless steel bracelet watch with black dial. Screw down crown. Collection: Townsman. Strap Material: Stainless Steel. Case Size: 44mm. So you don't have to ask and wait for our response. 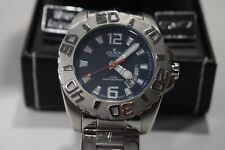 Cardinal Quartz Vintage Men Diving Watch. In Mint Shape. No Scratches. We are YOUR authorized Bering watches dealer! BillyTheTree IS AN AUTHORIZED DEALER OF BERING WATCHES! Exactly 280 years ago, the Danish sailor Vitus Bering braced himself for a daring adventure: in 1728 he set sail for an almost unknown area of the Arctic Ocean. Model: T1094101803200. Water Resistance: 30M. Band Width: 18mm. Bracelet Color: Black/White. Bracelet: Nylon. Dial Color: White. Crown: Push/pull. Case Size: 38mm. Chronograph Function. It's legitimate on your part to feel a little apprehensive about ordering on the internet or from another country, but we would like to assure you that your watch will reach you safely exactly as promised. Link watch with app on your smart phone. Black leather strap. Gents Nautica Watch Collection. Chronograph Function. ( USA, APO, FPO, AND TERRITORIES). ( USA, APO, FPO, AND TERRITORIES). Warranty: 5 Years from manufacturer. Top One International Corp. Marc Jacobs. From Shinola's website CASE SIZE 41mm. Minimalist stainless steel is combined in this classic watch with its chronograph, black calfskin leather band and aesthetic accents. The round rose gold tone stainless steel case houses a blue sunray dial, date window at 4 o'clock and protected by sapphire crystal. Shock & Water-proof. Note: the module in this watch is 1698, the back plate is from a different (compatible) G-Shock showing a different module number. Watch only. Nice watch. Ready to wear! Luminox 8815 Black Ops Carbon Men's Watch 8800 Series. Condition is Pre-owned. Like new condition with very little wear on it. The case and crystal show no scratches, the tritium glows and it runs accurately. Water resistant to 200m. INDIGLO® Night-Light. Indiglo: Yes. This process does not work using an "App". Typically 1-12 hours after the request is done. Band Color: Black. Hook and Loop Strap. Dial Color: Digital. Case Width (mm): 39. Model number FS5075. Part Number FS5075. Band Material leather calfskin. Watch Information. Dial window material type Mineral. Band Color Brown. Dial color Gold. Case material Stainless steel. SUBDIALS DISPLAY SECONDS, MINUTES AND HOURS WHEN USING THE CHRONOGRAPH. STANDARD PULL-PUSH CROWN. SNAP CASE BACK. MINERAL CRYSTAL. DATE DISPLAY WINDOW. BRUSHED WITH POLISHED ACCENTS STAINLESS STEEL BRACELET WITH HIDDEN BUTTERFLY BUCKLE. Model Ironman Shock 30-Lap Full. Features Alarm. Watch Shape Round. Product Key Features. Face Structure Round. This process does not work using an "App". Typically 1-12 hours after the request is done. Black ceramic case with a black fabric strap. Fixed black ceramic bezel. Black dial with silver-tone hands and index hour markers. Dial Type: Analog. Luminescent hands and markers. Date display at the 3 o'clock position. Rado Calibre 115 quartz movement. Scratch resistant sapphire crystal. Pull / push crown. Solid case back. Round case shape, case size: 40 mm, case thickness: 8.9 mm. Band width: 20 mm. Tang clasp. Water resistant at 50 meters / 165 feet. Functions: date, hour, minute, second. Casual watch style. Watch label: Swiss Made. Rado True Black Dial Men's Watch R27232106. Model: CC 311171. Quartz Chronograph Wrist Watch. Bracelet: Rubber Band W/ Clasp. Dial: Black Faux Carbon Fiber Date window in the 3 o'clock position. w/ Date Window. Swatch Bottone PWK153 Limited Edition Pop Swatch Christmas 1991 NEW!. Battery not included. Shipped with USPS First Class Package. Private seller.Battery needs to be replaced. Movado Watch. Black Leather Movado Band 22mm. BLACK MUSEUM DIAL. Stainless Steel. watch only . Sapphire Crystal. Trending at C $264.08eBay determines this price through a machine-learned model of the product's sale prices within the last 90 days. BFC series. A beige dial with a mineral crystal. Buckle clasp. Minute markers. 20 mm brown leather strap. Watch Details. Silver tone luminous hands. Hands: hours, minutes, and seconds. 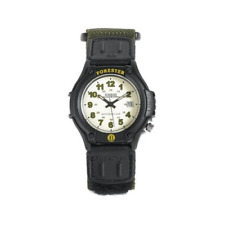 SWAE "Veteran" Watch - Camo and Black straps included! 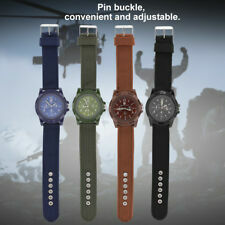 SWAE Watches introduces THE VETERAN, 100% original in design. This one of a kind watch boasts a scratch resistant mineral crystal glass; made to withstand your toughest tasks. Pictures do not represent the amazing appearance that this watch boasts! Stainless steel case with a brown leather strap. Fixed stainless steel bezel. Blue dial with luminous silver-tone hands and index hour markers. Minute markers around the outer rim. Dial Type: Analog. Luminescent hands and markers. Chronograph - two sub-dials displaying: 60 second and 60 minute. Quartz movement. Scratch resistant mineral crystal. Pull / push crown. Solid case back. Case size: 44 mm. Case thickness: 12 mm. Round case shape. Band width: 22 mm. Tang clasp. Water resistant at 50 meters / 165 feet. Functions: chronograph, hour, minute, second. Additional Info: In general, suitable for short periods of recreational swimming, but not diving or snorkeling. Casual watch style. Fossil Townsman Chronograph Blue Dial Men's Watch FS5279. LCD、light、alarm working well. watch bracelet not original. Sku: A105510. ITEM# A105510. Model: A105510. Manufacturer: Nixon. Sasy420 /Nixon. Band material: leather. Band color:black. Band width: 23 mm. Ferrari Scuderia Pit Crew Mens Watch 0830156 New. Condition is New with tags. We present to you a BRAND NEW Stauer 1926 Quarte Stainless Steel Back Water Resistant Genuine Leather Wristwatch! This beautiful piece is sure to receive many compliments! Length: 9 1/2 Inch(es) Width: 3/4 Inch(es) Weight: 49.2 Grams Hallmarked: 19084 "Stainless Steel Back" "3ATM WATER RESISTANT" "JAPAN MOVEMENT" Signed "STAUER" We gladly combine shipping! Everything is packed with care to make sure it arrives safely. We hunt the globe for wonderful treasures that we can present to you! We only sell authentic items. If it is a name brand item we guarantee it to be authentic. If it is made of precious metal and or gems, we guarantee it to be as described. Please check our feedback and buy with confidence.